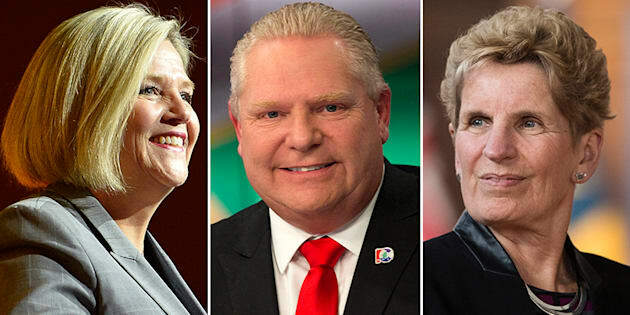 L to R: Ontario NDP Leader Andrea Horwath, PC Leader Doug Ford and Liberal Leader Kathleen Wynne faced off in the first debate ahead of the province's election in June. TORONTO — Doug Ford was the main target in the first debate ahead of Ontario's provincial election, with his rivals suggesting Monday that the Progressive Conservative leader, who is leading in the polls, would slash jobs and shrink services if elected premier. Liberal Premier Kathleen Wynne and NDP Leader Andrea Horwath spent much of their time warning about what a Tory government would bring, while Ford hammered home his key messages of finding "efficiencies" and "respecting the taxpayers." "The other Conservative leaders, Mr. (Tim) Hudak, Mr. (Mike) Harris — they were very upfront about what their cuts are going to look like," Horwath told Ford. "Why don't you have the guts to tell people what your cuts are going to look like? What is in store for the people of Ontario?" Ford didn't provide specifics, though he has promised to cut four per cent from the budget. Liberal Premier Kathleen Wynne, centre, Progressive Conservative Leader Doug Ford, left, and NDP Leader Andrea Horwath shake hands at the Ontario Leaders debate in Toronto on May 7, 2018. "I'm going to make sure we run a government that respects the taxpayers," Ford said during his closing remarks. "You know me. I'm for the little guy." Horwath repeated that voters "don't have to choose between bad and worse," several times stepping back when Wynne and Ford began to spar, attempting to set herself apart from them. Wynne said the election features "some pretty stark choices," between what she calls her plan for care and Ford's plan for cuts. The premier also suggested that Ford's plan to find "efficiencies" really means firing nurses and teachers — harkening back to the Liberals' warnings about former Tory leader Tim Hudak's 2014 proposal to cut 100,000 public sector jobs. "Not one single person is getting laid off under our administration," Ford vowed. "I love the nurses. I love the teachers. I'm going to support them 100 per cent." "Yeah, but you're going to cut their jobs," Wynne shot back. Wynne also tangled with Ford over the placement of LCBO-run cannabis stores. In some cases, Ford said Wynne's government placed them too close to schools, which the premier denied. "You have to look at the evidence, you have to look at what the experts say, you can't just have a slogan that then becomes a policy," she said. "That's not how it works." Ford also used the debate to announce that he would commit $5 billion more than what has already been allocated to build a regional transportation system in the Toronto area, including subways, relief lines, and two-way GO Transit to Niagara Falls. New Democratic Party Leader Andrea Horwath arrives at City TV Studios ahead of the first televised Ontario Leaders Debate in Toronto on May 7, 2018. After the debate Ford told reporters the plan would also upload the TTC's subway system to the province. Cristine de Clercy, associate political science professor at Western University, said Ford performed well given that this was his first debate against two more experienced leaders. He didn't make any major mistakes and also announced his transit funding commitment but did little else to offer up details on his plan. "Mr. Ford spent most of his time on the defensive," she said. "He didn't layout his plan...and if you were looking for those answers it wasn't a very satisfying debate." De Clercy said Ford's pledge not to layoff any public sector workers while cutting four per cent of the provincial budget could come back to haunt him, as both Wynne and Horwath effectively communicated, she said. "I think he's really put himself in a box there," she said. De Clercy said Horwath also performed well, staying upbeat and asking tough questions. Barry Kay, a political science professor at Wilfrid Laurier University, said given Ford's position as front-runner in the polls he appears to have taken a low-risk approach to the debate. The Tory leader said little to get himself in trouble but at times looked out of place, he said. "He didn't seem comfortable," Kay said. "He was the least impressive in terms of style. He's trying to make sure he doesn't make any mistakes." Kay said Wynne did a capable job of engaging both Ford and Horwath on policy, but it may not matter in the eyes of voters. "She came across as very knowledgeable but frankly, I don't think it matters," he said. "She needs one of the other leaders to make a mistake to win." The Ontario election takes place June 7.